The Ridings at North Branch - Delmarva Site Development, Inc. The Ridings at North Branch is a single family development consisting of 42 residences just to the east of Crofton, Maryland. This upscale community re-purposed an existing equestrian center and adjoining sod farm to allow for its development. Once construction is complete, the residents of this community will enjoy over 150 acres of green area as well as a equestrian parcel allowing the property to retain its original feel. Once again, Delmarva was able to provide our client with a turn-key development package. 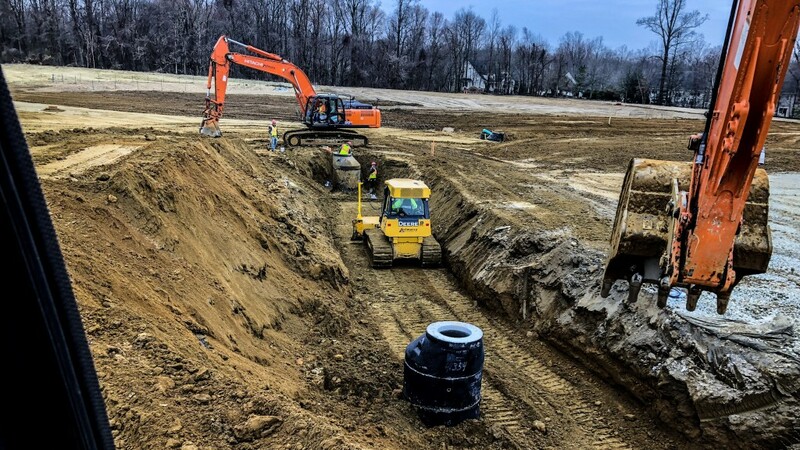 Our scope included everything from demolition of the existing equestrian center and sod farm to final asphalt, the installation of bio-swales, and the restorative work to the stream channels on the property via the installation of several coastal plain outfall systems. Delmarva has been a primary site development contractor for Toll Brothers for over 13 years. Their superior office and field management teams consistently produce quality work, and can be relied upon to deliver our projects on time. In addition, their estimating staff is always willing to provide budget and value engineering guidance on our future projects. We consider Delmarva to be a valuable member of our team, and would highly recommend them to anyone.